This is a sponsored post written by me on behalf of Cottonelle. Lalala… I love the Holidays. It’s, without a doubt, my favorite time of the year. Everything about it just makes me so happy and bright. I can barely handle it. 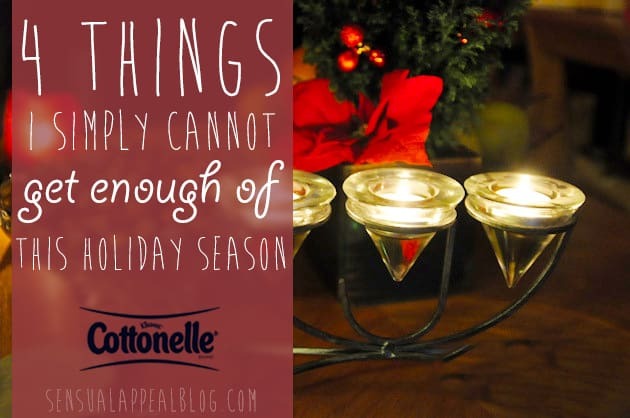 That’s why I decided to put together a quick list of things I simply cannot get enough of this Holiday season! Can you relate to any of these things? Let me know in the comment section! Then scroll all the way to the bottom to learn a little bit about the sponsor of this post and the lovely giveaway they are holding on Pinterest with daily winners. Everyone could use a bit of extra cash around this season huh? Yes, everyone includes you too! Everyone who knows me knows how much I love Christmas. One of the main reasons being the Christmas lights… they are just so amazing. I feel like having these lovely twinkly lights make everything look so much more festive and cute, not to mention cozy. I love walking down Magnificent Mile during the Holidays because of the street lined with Christmas lights on trees. It’s such a beautiful sight. My roommate and I decorated our apartment for the Holidays last week and it looks gorgeous now! She brought in her Christmas tree (pre-lit) that’s white (gorgeoussss) and we put up extra lights above our bookcases and I have a set of lights in my room as well. Umm… okay, well where the heck is snow!? I mean, I’m not surprised it’s not really falling that much since it doesn’t usually hit in Chicago until after Christmas, but every year I am hopeful that it will snow more before Christmas (and especially before/on/right after Christmas Eve (since us Polish people celebrate Christmas Eve aka Wigilia more so than Christmas Day). It has snowed twice so far. Once was nice and it was snowing beautifully all day when I was at work and it made me just so happy jolly and hyper, haha. It’s just been really darn cold lately. I’m not a big fan of cold but if it’s gonna be cold, can it at least snow too, please? I’m just so darn happy lately. Certainly my free course into #SensualJoy had something to do with it but I have also been implementing many more techniques to focus on happiness and joy and they have all been helping me tremendously with just living in the present and being grateful for all I have. Yes. I am grateful for all I have and I hope you take this post as me wanting more of things in a lighthearted way. I have been practicing positive affirmations on a regular basis and keeping a gratitude journal that I write in almost every day. On the days I don’t feel like writing, I pray out loud by telling ‘God/Universe/My Higher Self’ the three things I am grateful for that given day. It’s been very healing and a deeply gratifying experience. I’m going to do a post in the near future of all the books I’ve been reading that have been drastically changing how I live for the better. Yeah I have turned into a bit of a chocolate monster in the past few days and I am not even ashamed, ha. How can you say no to chocolate anyway? Or these indulgent Surprise Cookies. Impossible, I tell you. Have no shame. I’m enjoying my chocolate lust. But that isn’t to say I’m not looking forward to doing a 3 day juice cleanse after the Holidays, haha. There is just too much sugar going on in this girl’s life right now. I absolutely love the Holiday season – it’s most definitely my favorite time of the year. It’s wonderful and comfy and cute and delicious. It can also, however, get a bit stressful for those who work full time and try to host holiday parties. Many of us are people pleasers and any disaster averted is a little celebration. It’s good be well prepared during the Holidays by having a little bit extra of everything on hand. It’s good to be prepared. Being that I work in marketing, Q4 is always extremely busy with clients trying to do as much as possible for the Holiday season – this often means I stay at work later than usual and therefore have less time for essentials, like grocery shopping. So obviously I try to stock up much more now than I would otherwise. No more multiple grocery trips during the week like I did when I was unemployed (darn). That’s why it’s good to have more of things at hand so you don’t run out. Having only 25 percent more on hand can make a big impact on your sanity and your successful hosting this Holiday season. To go along with the More is Better theme, Cottonelle now has 25 percent more sheets per roll than the competitor. It’s simple, we get busy during the Holidays and we get all the help with can get, especially if you host big Holiday parties at your house. Having 25 percent more this holiday season can make a big impact. Follow the conversation about this topic on Twitter using the hashtag #MoreIsBetter. What can’t YOU get enough of this Holiday season? Definitely can’t get enough of the sweets and treats and all of your chocolate desserts look fabulous! Time- there isn’t enough time!!! BUT I love the warm chocolates and the happy faces and the Christmas music and the smell of my real Christmas tree!